There’s nothing more satisfying than growing your own fruit and vegetables. From helping the kids understand where food comes from, to saving you money on meals and getting fresh and healthy produce into your diet – starting a vegetable garden can benefit your family in several ways and it’s loads of fun too! If you aren’t sure how to start a vegetable garden from scratch but it’s something you want to have a go at, our handy guide is full of hints and tips on gardening like a pro! It’s important to choose a sunny spot so that your crops get at least 6 hours of sunshine a day. The more sun, the bigger and better the vegetables will be! You might not have room for a huge vegetable garden, but you don’t need loads of space to grow your own vegetables. You can easily plant your potatoes in a compact grow bag. If you decide to grow from the ground, it can be a lot of work. Raised vegetable beds make a neater and more simple solution to growing your own. It’s also easier on your back when weeding and harvesting. Vegetables don’t like frost, so wait until your last frost has cleared before you start planting them. You won’t need too many gardening tools but you should pick up the essentials. These include a spade, trowel, watering can and gardening gloves. Your soil should be high in nutrients, so if you’re planting in the ground, add new compost each year. For raised beds, mix compost, top soil and peat moss for best results. You don’t want to grow so many plants that you end up throwing some away. Think about the vegetables your family likes to eat and have a go at growing those first. Some vegetables are easier to grow than others. Depending on the crop, you can either grow directly from the soil or using containers. 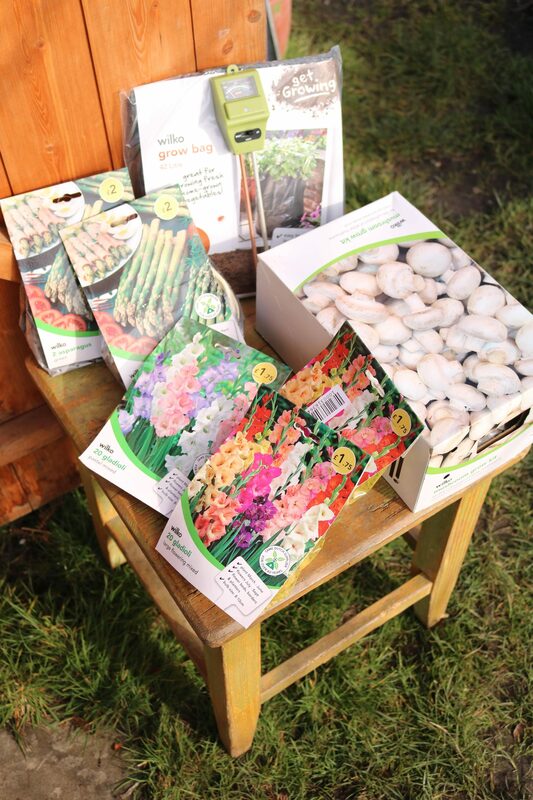 Growing kits make it even easier to get growing and come with everything you’ll need to get started. Plant tomatoes after the last frost in a warm and sunny spot, with a support to keep them from toppling over. Or plant a cherry tomato plant to get your tomato-fix before the autumn frost arrives. Potatoes are easy to grow and are a great first crop for a new garden bed. It’s best to plant potatoes just after the last frost or in early spring. Top tip: Every potato you get from one plant will grow in the space between the seed and soil, so create deep holes and fill with lots of compost or mulch. Perfect for planting in spring or late summer, carrots are quick-growing seeds which do best in cooler temperatures and deep, loose soil. Top tip: When the tops are about 2 inches tall, pull out enough small plants to leave enough room for bigger ones. And lastly…remember to have fun! Share photos of your vegetable garden with us on Facebook, Instagram and Twitter.